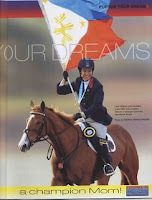 I don't understand much about the sport, but I love watching equestrian especially women riders. Equestriennes look very graceful riding their horses while doing their routines. Horse riding is considered to be a royal sport. It could very well be a rich person's sport/game. Horses are very expensive. A well-trained thoroughbred costs a fortune. Add to it the maintenance and horse equipment. It will cost the ordinary person his arm and leg.